The Settlers of Catan only takes about 90 minutes, or 2 hours if you're talking and socializing while you play. The board game encourages trading and interaction between players, so you're talking and laughing as you go, not silently staring at game pieces. How many times have you bought a board game only to play it 5-10 times? We first came across The Settlers of Catan board game more than 3 years ago, and it's still one of the most played board games in our cabinet. Each time you play Settlers of Catan, the game board is created randomly. That means you never play the same game twice. This board game is an investment for years to come. The Settlers of Catan is based on an island. You and your players arrive on the island and begin to build your settlements. Roads, towns and cities spring up around the board as you race to become the first player with 10 victory points. Victory points are awarded for size and quality of your settlement. You gather resources by producing them based on the terrain surrounding your towns, or trade with other players. These are used to build a larger settlement, armies, and improvements such as cathedrals. After one player amasses 10 points, the game ends. And usually, we immediately set it up and play again! The Settlers of Catan is an excellent boardgame to add to your collection ! This board game will still appeal to true strategists since it still has many levels of complexity. I'm going to be upfront and say that I love The Settlers of Catan board game. Maybe it helps that I'm good at it and win more often than I lose. Still, I'm going to tell you why I think you should get into this board game and fall in love it yourself. The Settlers of Catan is already a modern classic. Millions of people play and love this game. It's getting to the point where it's hard to talk to gamers without knowing how to play this board game. But that's not why you should get this game. The Settlers of Catan stands on its own, head and shoulders above other games. It's not the only game I own. There are situations when another game fits the group and the mood better. But no other one game can be played by so many different people in so many different situations. The Settlers of Catan is the new Monopoly, without sucking like Monopoly does. With your family? Play Settlers. With your friends? Play Settlers. Got a spare hour? Play Settlers. Got a whole evening? Play Settlers a couple of times. Hey y'all. 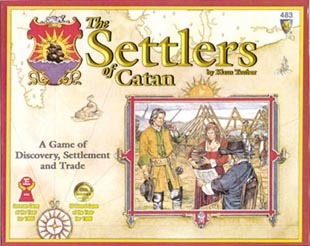 The Settlers of Catan board game. What can you say? It's not my favourite game of all time, but you have to give it credit. It's a great game. It's hugely popular. And all kinds of people just love playing this game. With my buddies, if I say "Let's play a game," someone without fail proposes Settlers of Catan. Like I say, this isn't my very favourite game. There are some glitches that people do criticise about The Settlers of Catan. First is that chance plays too much of a role with the dice rolling. I usually discard this criticism out of hand. It's an odd thing to say: games almost always involve chance. (For the exception that proves the rule, see Diplomacy - ed.) Having said that, The Settlers of Catan has this weird mojo happening. It seems that every game one number is almost never rolled. Some player ends up with a brick producing town which has a high-probability number like "8", and it just never gets rolled and that player spends all game begging for brick. One more thing I'd like to mention is that the initial placement of towns and roads is an important part of the strategy in The Settlers of Catan board game. People complain about this sometimes, and I think there is some merit to that argument, however the simple fact is that a bad player will ruin a good initial placement as surely as a good player can overcome a poor initial placement. While it is important, anyone who thinks a good initial placement affords them the chance to relax will be greatly surprised. I don't want the length of this review to get out of hand, so I'll stop there. The board game reviews above by the manufacturer and Rainy Day Games lay out the case for to buy this board game well. The only reason not to get this game is if you're fatally allergic to dice. Otherwise, run out and buy The Settlers of Catan board game! After having played about 5 or 6 sessions, I must admit that the hype about this game is somewhat deserved. Though some will not find the game they are looking for, I believe this is a game that can appeal to a mass audience. What makes me like The Settlers of Catan so much is that you are never really just waiting for your turn. The game is involving for everyone. Every die roll can have an effect on you and every turn, there is the potential for you to make trades which adds to the interaction in this game. Rarely will you find a moment where no one is speaking. There is some strategy involved in understanding the law of averages and also about how you might or might not be able to expand. There is also some strategy in understanding how to negotiate with others. Who do I recommend The Settlers of Catan to? -Casual gamers -Social gamers -Strategy gamers -Placement building gamers Who should stay away from this game? -Die-hard Wargamers I would have to say that just about everyone has the potential to enjoy this game (even the die-hard). The lack of intense strategy is what might deter die-hard gamers from playing again. This is a game made to be played while relaxing. This is a game where you can finally get your girlfriends/wives to play with you because of the increased interaction. (If you want them to get into wargaming, you'll have better luck starting here). Great Game!!! The Settlers of Catan is a game for serious gamers, and the not so serious gamers. Just a few of the great things about this game include. 1. It is almost imposible to have a runaway winner becuase you either do not trade with the leader, and/or you put the robber on something that hurts the leader. 2. This game is very easy to learn. 3. Once you have played this game a couple of times, it doesn't take very long to play (just 45 minutes to 1 hour 30 minutes) 4. you can play this game again and again, and it is still fun. The only negative is that bad luck can cause you to lose this game badly.